لا يمكنك العثور على هذا النوع من القمصان المتنوعة في أي مكان آخر على الإنترنت بأسعار معقولة! لدينا أكبر تشكيلة من الملابس كاليفورنيا ريبابليك وقمصان مضحكة لتختار من بينها. جميع التي شيرتات الخاصة بنا مصنوعة من القطن بنسبة 100%، مريحة للغاية عند الارتداء، بضمان طويل الأمد. ارتد قميصك بكل فخر! I bought this for Valentine’s Day. My husband hates long sleeve shirts but it was pretty cold so I figured this would combat some cold weather a bit. He’s between sizes (medium and large) but I got a medium and it fit great. His sleeves were perfect and the length was awesome. Not too long and not too short after washing. It lifts up some and he's about 5'10. If you're taller, I'd size up because your belt/boxers may show. This was the perfect cheap yet quality shirt I’ve bought him in a long time. It’s thin like not for winter wear where you wouldn’t need a jacket but more like 60 degrees this would be enough by itself. Nice long sleeve t-shirt for SUMMER / WARM weather use. 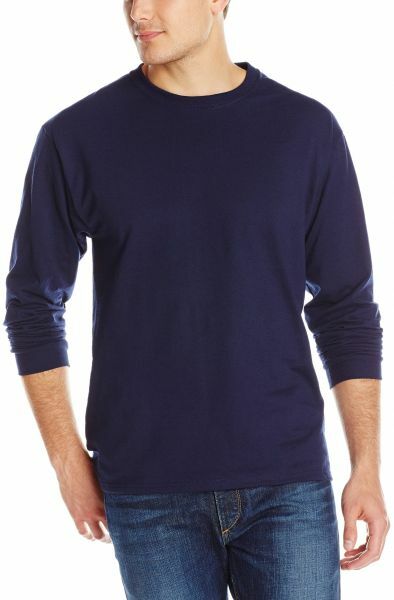 This is a nice long sleeve t-shirt for SUMMER / WARM weather use. Construction quality is good / very good. It is NOT a heavy weight t-shirt. I wish it was, but it is not. It is not chinssey 'paper thin' either, it is somewhere in the middle of a great heavy weight T (the old Jerzees T shirts I still have and love) and a el' cheap-o T shirt. If you buy it with the intentions of keeping some sun off your arms in warm weather, for that purpose you will be satisfied. In cooler weather I wore this long sleeve T and another print screen type heavy weight short sleeve T over the long sleeve T. This layered combo worked great for 50 - 60 degree temps. Sizing; I ordered the medium, and it was slightly small. Given a wash and a dry in the dryer (shrinkage) and it would have been too small. I sent back the mediums for Large. The large fit me perfect. I am 5'11+ (almost 6'), 44 chest, 33 waist, 185 pounds. Hope this review help you. If yes... give the review a vote ! Thanks ! Fit is on the mark! I bought this long sleeve t shirt to wear for outdoor exercise when the weather cools down a bit. It's nice and light, and wicks moisture. The one aspect of this shirt that makes it stand out for me is the fit, which is spot-on for the marked size. I am pretty much a perfect size medium (5'8" and 160 pounds, with an athletic build) but in some cases I get stuck buying a large because the medium is too tight across my chest and shoulders. In those cases the large is always too long in the body and arms which makes it look and feel sloppy. This Jerzees shirt is proportioned just right for me in my actual size. This will be my go-to brand for this type of shirt from here forward. Ordered a medium & was a good shirt. Was comfy but just a little roomy but not that big of a deal. I'm assuming i can shrink it if it tried & it won't be as roomy since it's 50% cotton. I like this shirt because the bottom is long enough to go past my pockets and does not feel like it is riding up when I move and the sleeves and long enough when I stretch out my arms it doesn't look like the shirt is to small. its a little thicker than the Hanes Men's Long Sleeve Nano T-Shirts I got at the same time but they are not so thick that I can't put another short sleeve shirt on over it. i would recommend this shirt just a little more than the hanes but only because it is a little thicker and i live in a place where it gets cold.